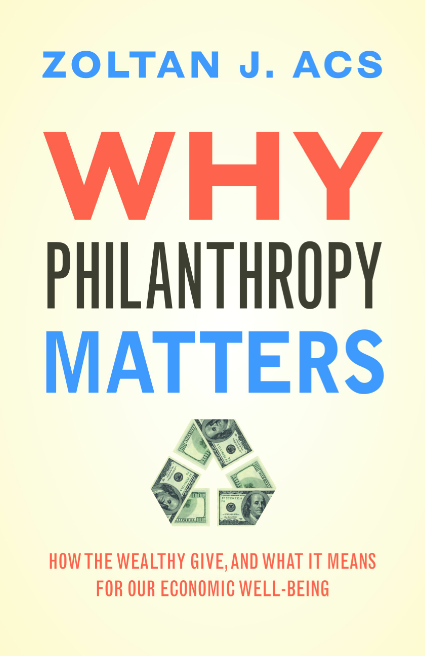 Why Philanthropy Matters: How the Wealthy Give, and What it Means for Our Economic Well-Being, Zoltan J Acs, Princeton University Press, $29.95. In Why Philanthropy Matters, Zoltan Acs traces the role of philanthropy in the history of the United States, arguing the practice is a cornerstone of American-style capitalism and intrinsically linked to entrepreneurship, opportunity and wealth creation. In Arcs’ view, the success of the American model has developed through a dynamic process both enabling and requiring philanthropy: giving is a catalyst for innovation (proxy for wealth creation) and a creator of opportunities (softening inevitable inequality). The combination of capitalistic entrepreneurship and philanthropic giving is depicted as unique among developed nations and ripe for export. The numerous examples Acs supplies may be enticing, but the assumptions and conclusions remain unpersuasive. The role of philanthropy in shaping the uniqueness of American-style capitalism is neither proven, nor convincingly demonstrated. Indeed, one could argue philanthropy was not an inherent cultural element, but a necessary offset to a weak social system. Moreover, philanthropic initiatives not focused on innovation and capitalistic progress – for instance, those devoted to the arts, environment and labor rights – are merely considered. The same goes for international aid. While punctuated by amusing anecdotes, this is an American-centric book valuable mostly for the insights it offers on why American philanthropy has mattered to America.